This PMR study offers an eight-year analysis and forecast of the global vibratory hammer market between 2018 and 2026. The vibratory hammer market study considers 2017 as the base year with market values estimated for 2018 and a forecast developed for the duration between 2018 and 2026. Compound Average Growth Rate (CAGR) has been represented from 2016 to 2026. The study covers various perspectives of the global vibratory hammer market, including market dynamics, value chain, pricing analysis, competition analysis, regional and segmental growth comparison and macro-economic, along with segment level projections in a comprehensive manner. 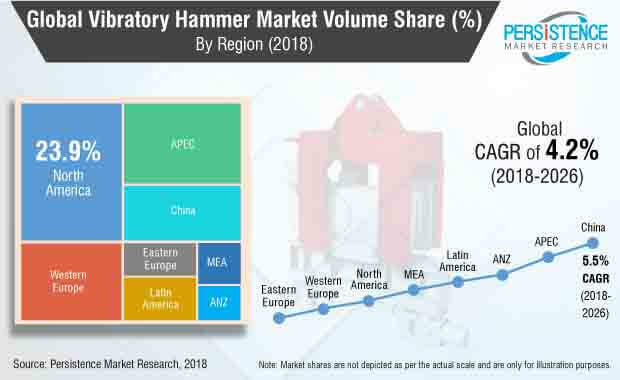 As per the findings of the study and perspectives of industry participants, the global vibratory hammer market is projected to grow at a CAGR of 4.5% between 2018 and 2026 in terms of value. Increasing investments in infrastructural projects and rising investments in non-conventional energy sources are some of the factors positively impacting the uptake of vibratory hammers in the global market. This Persistence Market Research report carefully analyses the vibratory hammer market at a global and regional level through market segmentation on the basis of key parameters such as mounting, centrifugal force and end use industry. The primary objective of the report is to offer key insights on market updates, competition positioning, current trends, market potential, growth rates and other relevant information and statistics in a suitable manner to the readers or various stakeholders in the vibratory hammer market. A vibratory hammer is an equipment/tool utilized to drive piles in/out of the ground for various applications, such as building bridges, buildings, rail, walls, roads, marine docks and several other types of foundations. Traditionally, pile drivers are used instead of vibratory hammers for these applications. However, due to various advantages of vibratory hammers, such as fast operation, light weight, environmental protection, etc., they are preferred over traditional pile drivers. In this Vibratory Hammer market report, we have considered Vibratory Hammers that are utilized in construction and offshore industry only. In this Vibratory hammer report, we have crunched the market for crane mounted vibratory hammers as well as excavator mounted vibratory hammers. The excavator mounted segment is projected to remain dominant in terms of both volume and value market share and is estimated to grow with high value - high growth rate. With the growth in infrastructural development, the demand for excavator mounted vibratory hammers is increasing, which will create significant opportunities for suppliers of vibratory hammers in the global Vibratory Hammer market. The global construction industry is registering steady growth due to high rate of urbanization and increasing demand for roads, rails, buildings, etc. due to the growth in population. Governments of various economies across the globe are focusing on development of transportation infrastructure. Such initiatives by various governments will boost construction projects across the globe and in turn, result in growth of foundation work, which in turn, will fuel the demand for vibratory hammers. Moreover, technological advancements in hydraulic fracturing have resulted in a major shift from conventional utilities production to non-conventional shale gas and tight oil production. Growing production of shale gas and tight oil, especially in the U.S. and Canada, is expected to result in an increase in foundation works for production facilities of shale gas and tight oil and thus, is likely to amplify the demand for vibratory hammers. In the Vibratory Hammer market, manufacturers, such as BAUER Maschinen GmbH, Liebherr Group, American Piledriving Equipment, Yongan Machinery Co.,Ltd, Guangdong Liyuan Hydraulic machinery Company Ltd, EMS GROUP, . International Construction Equipment, OMS Pile Driving Equipment GmbH, Hercules Machinery Corporation, Xuzhou Hercules Machine Manufacture Co., Ltd., Hydraulic Power Systems, Inc., ABI Equipment Limited, PTC (Fayat Group), Les Produits Gilbert Inc., are some of the prominent players. These days, vibratory hammer manufacturers are focusing on mergers & acquisitions to increase their presence in the global market. The Vibratory Hammer market is a consolidated market as Tier-1 players are expected to hold significant share in the global market. The key players have strong presence across the globe. Tier-2 & Tier-3 players are projected to account for approximately 40% to 50% share in the global vibratory hammer market and are also projected to generate more than US$ 64,000 Thds in revenue in the Vibratory Hammer market. Our research methodology for this study on Vibratory Hammer market is based on some key points, such as Defining Research Problems and Objectives; Collecting, Analyzing and Interpreting Information; Selecting Methods of Data Collection; and Deciding the Type of Data and Developing the Final Research Plan. During the research, we conducted a deep dive research analysis on the applications of Vibratory Hammers. Our team collected data pertaining to new vibratory hammer sales per region and country from various sources, such as vibratory hammer manufacturers’ annual presentations & reports. We also conducted primary interviews with vibratory hammer manufacturers, suppliers and experts who have vast experience in the vibratory hammer market. How has the Vibratory Hammer market evolved in the past four years? What shape is the Vibratory Hammer market expected to take in terms of volume and value during the study period? What are some of the prevailing market dynamics in the Vibratory Hammer market? What are some of the competition developments and trends affecting the Vibratory Hammer market? What are some of the underlying macro-economic and industry factors impacting the growth of the Vibratory Hammer market? How is the competition structured at present and how has it evolved in the Vibratory Hammer market over the past few years? Some of the key players involved in the manufacturing of Vibratory Hammers and included in this study are BAUER Maschinen GmbH, Liebherr Group, American Piledriving Equipment, Yongan Machinery Co.,Ltd, Guangdong Liyuan Hydraulic machinery Company Ltd, EMS GROUP, . International Construction Equipment, OMS Pile Driving Equipment GmbH, Hercules Machinery Corporation, Xuzhou Hercules Machine Manufacture Co., Ltd., Hydraulic Power Systems, Inc., ABI Equipment Limited, PTC (Fayat Group) and Les Produits Gilbert Inc., among others. Shinsegae Power Equip Industrial Co., Ltd.